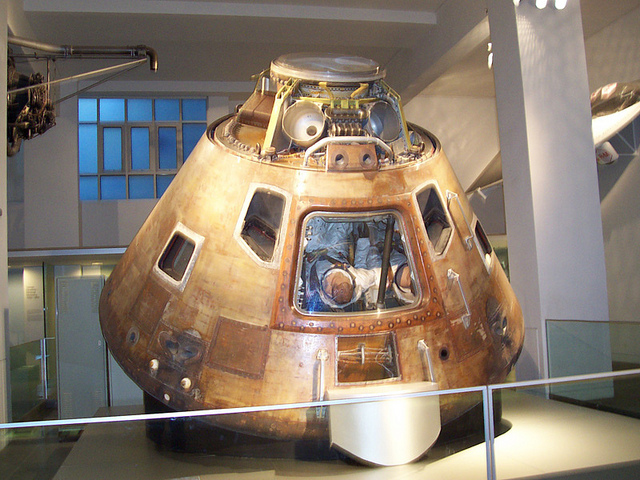 Though it didn't actually land on the moon, the Apollo 10 mission took place in 1969 and was vital in the build-up to test the landing of its immediate successor, Apollo 11, on the moon, and the original command module - often known by the nickname Charlie Brown - is found in the Making the Modern World gallery at the Science Museum in South Kensington. Some 44 years after its mission it is amazing to see this module in place in a museum gallery, and looking at it says little about the amazing things it has achieved, setting a speed record of 24,791 mph and carrying only the second crew to orbit the Moon, before splashing to earth 400 nautical miles east of American Samoa. We had a Christmas party there a few years ago, and my colleague spilt white wine on it. I was horrified and asked an attendant to wipe in clean, but of course she wasn't allowed. It's probably eroded a heat shield by now.